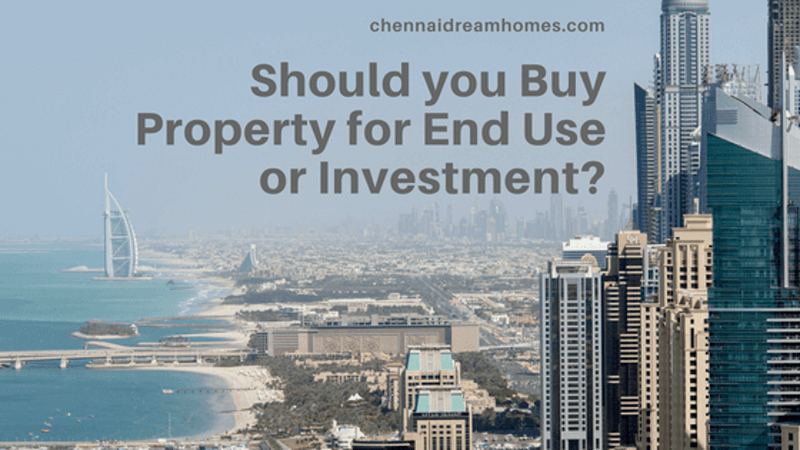 Should You Buy Property In Chennai For End Use Or Investment? Should you buy Property for End Use or Investment – Which is right for you? To Buy Property in Chennai in your name should be a guided decision with the goals and objectives defined. One simply cannot leave room for confusion when it comes to putting your lifelong savings in the Chennai realty market. Although investing and end use are the two most common terms when it comes to the decision of buying property, not many know the difference between both. For example, while the location is of paramount importance when buying a home for end-use, one could compromise a little when it comes to an investment. In this blog, we will be taking a look at the 4 critical criteria that could influence our choices when buying property. For persons who are planning to buy property in Chennai, or move into a home sooner than later, location plays a vital role. Ensure the locality is conveniently situated, so it caters to all your needs. The property should be near facilities such as schools, hospitals, and malls while being connected to other parts of Chennai. While for those looking to make a profit on buying a property, thorough research of Chennai properties to find emerging localities just outside the city which may provide a healthy return on investment. These developing areas might not have much regarding social and physical facilities in place right now, but they provide a lower entry price and therefore more potential for appreciation later. The stage of construction of the property you are looking to buy is important, as it determines how much you spend monthly if you are looking to get a home loan. If you are looking to get a property for end use, it will be better to get one near completion, so you don’t bear the burden of rent and construction linked payments or monthly home loan EMIs. However, buying a property closer to completion means you get to spend more so you must consider all the information available thoroughly before coming to a decision. If you are looking to make quick returns, then it makes sense to purchase Chennai properties at their launch or pre-launch stage. You pay less, but it’s riskier as you have to wait till delivery. Though RERA is in place to check delayed possessions, you may exit the property when it’s mid-way through construction and invest the gains in some other property although you will get maximum profit when you wait until the time of possession. If you can’t wait that long, then you could also invest when the property is partially ready. In this case, the initial investment would be higher, but you may begin making profits from the first year through rental income. When looking to buy property in Chennai as an end user, ensure the location has a well-developed infrastructure which includes a good road network, hospitals, good schools, and recreational spots in the vicinity. Before you buy property in Chennai, you should also watch for easy accessibility to airports, railway stations, and bus stops. On the other hand, when buying for investment purpose, even though the location may not have any physical or social infrastructure in place, you should check to ensure it is included in the city’s master plan. Also check whether there are plans by any developers or the government to lift the area’s Quality index, which can boost rental growth later. Only you, the end-user, knows the kind of property that suits your needs – whether an independent house, gated villa, beach house, or apartment– so you should base your buying decision on the needs of your family. When making an investment purchase, you should look to get a property type which is in demand, which are usually plots for development later, Flats in OMR or Villas in ECR which can get good resale value. You can get information on this online or by interacting with a good property consultant or real estate agent who has the pulse of the market. We hope this article helped you clarify which is a better option for you right now. If you are convinced that buying is better than investing and want to move in to a home soon, contact us today. We’ll be happy to set you up with shortlisted homes that suit your style, budget, timeframe, etc. and schedule personalized site visits by appointment to get the process started!